This is my 25th installment of Babywearing Stories 365. Each installment features a babywearer in 1 photograph and their answers to 5 questions. My goal is to normalize, promote and celebrate daily Babywearing, moving beyond *what* we use to carry our babies and shifting focus back on *why* and *where* we carry. I hope to share the stories of moms, dads, and babywearing caregivers all over the world. Enjoy! I am Stephanie Bell, i am a mommy of two girls and got interested in baby-wearing while researching cloth diapers before my first daughter was born. I am wearing my DD1 Emeliatte ( she goes by emmy). ths was a family trip, so dh (chris) and dd2 (paisley) were also there along with my mom, her boyfriend, his daughter and my brother. She is being worn in a Babyhawk. 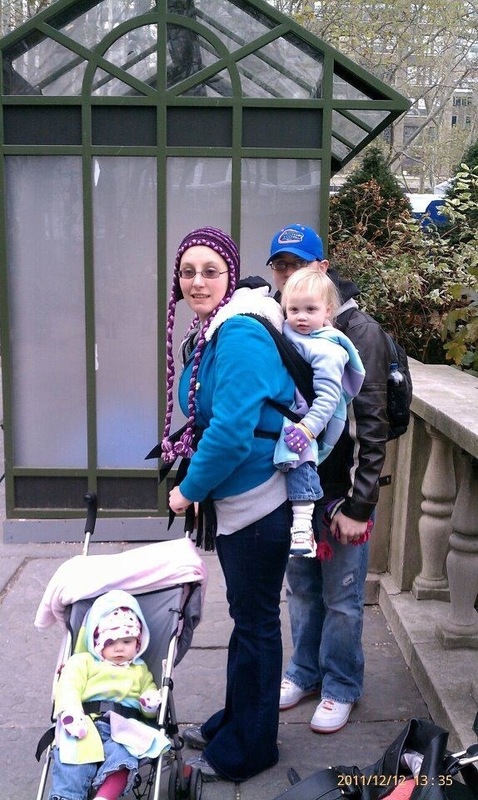 During this family trip to New york city, we took turns wearing either of the two girls and or pushing the stroller.